10 km wide tip of the Thompson Glacier in the Expediton Fiord area. Note Twin Otter that just landed on the tundra during the night at 3 AM during the midnight sun. After waiting for three days on Expedition Fiord, we were down to the last bits of food when the helicopter finally arrived. The helicopter pilot was in a hurry, only one load he shouted as the weather was poor. We had too leave the rest behind at the nearby and rarely used McGill University shack, the only building on the island, with a note, “If you find this please return this to …”. It may still be there. We had another 12 hours of flying time left over from the 30 hour budget we received from the Canadian government for the 1989 expedition in Northern Canada. This would be sufficient to do 4 flights by helicopter from the Eureka weather station to South Fiord on Eastern Axel Heiberg Island, which has a large salt dome, some 10 km across and 500 m high, and this is the biggest salt dome in the region. We first had to cross the 2000 m high glaciers of the Princess Margaret Range which is often covered in clouds. We left the end of July and this was the height of the summer, 4-6 degrees Celsius in Eureka. Today was fine, the helicopter flew low, just above the glaciers and between the rock peaks sticking out which are called Nunataks, to avoid the high winds and we reached the head of Expedition Fiord after 40 minutes. Now we were half way and I recognized the area where we had a very pleasant camp in1984 with a superb panorama. This area is nearly snow free as it is a warm oasis, a flood plain in a bowl surrounded by high mountains and the 10 km wide tip of the giant Thompson Glacier. This glacier is some 100 km long and dominates Axel Heiberg Island. South Fiord was another 40 minutes flying. We followed Expedition Fiord towards the Arctic Ocean and the area was increasingly covered with snow. I knew the area would be colder and have more snow but now I got worried. Arriving at South Fiord was spectacular. The weather was hazy and combined with the full cloud overcast the light was dim. The giant salt dome was rising from the low tundra next to the frozen Arctic Ocean and covered by 1 or 2 meters of snow which gave it a bright, massive appearance. Worse was that the low country was also fully covered in snow, I estimated around 50 to 100 cm. The pilot asked me if I really wanted to make a camp here. After taking another loop around the salt dome, I realized that little could be done as most of the rock outcrops were covered by snow. This reminded me of the camp near Otto Fiord a month ago were we had snow coming down for most of the 7 days and could do little work. Given the long distance, 1.5 hours is the maximum reach of the helicopter, the answer was simple. No! I could already imagine problems lifting the camp out a week later if the weather was poor. The helicopter would not be able to cross the Princess Margaret Range or take too long to reach us and the only alternative would be a lift out by Twin Otter. However, the sea ice is unstable end of July for landings on skis and we would have to prepare a landing strip somewhere in the snow covered area. Apart from landing problems, this would costs us some 10 hours in Twin Otter flying time at CAN $ 10000, flying time we would have to pay for as the Twin Otter budget was already consumed. We went back to the Expedition Fiord valley, the planned fall back option, with hesitation. Now we failed on studying the biggest dome of the area. The other two big ones, the Mokka and Gibbs Fiord domes on Eastern Axel Heiberg Island, I did already last year. 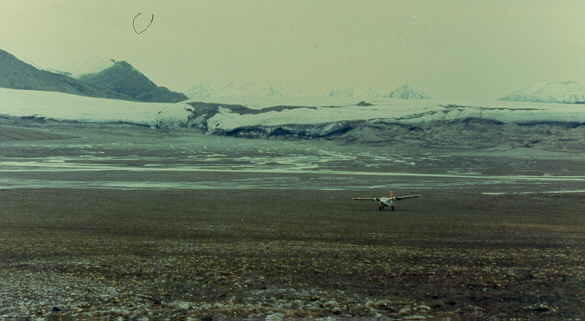 This Expedition Fiord Camp was very safe as it had a natural landing strip for Twin Otters. When a helicopter couldn’t fly due to heavy cloud cover on the mountains, the Twin Otter could often still fly, finding a hole in the cloud cover from high up and moving down. I was dropped of at the south end of the Expedition Fiord area using the old camp site of 1984. Jeff, my student would be picked up on the second load. This is a very save area for pick up as there is a large flat area where Twin Otters can land and this is how I got pulled out in 1984. This second choice area was also interesting as it has the Expedition Fiord Diapir, a complex of salt (anhydrite) sheets and dykes, proving the extreme fluid behaviour of anhydrite. I felt relieved and disappointed at the same time, the camp was good and save, with a splendid panorama. I always like to go back to old camps as you always have more things to study in detail. The sheets and dykes were puzzling. 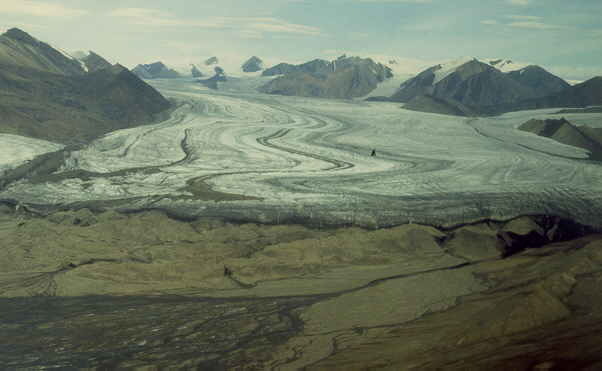 The tip of the glacier dominates the broad flood plain at only a 8 km distance and looks very near due to its giant size, some10 km wide and some 50 to 100 meters high. McGill University had a shack here since the early sixties when they did a combined glaciology and geology expedition. Glaciologist return once every few years to study the movement of the Thompson glacier. Jeff joined me 2 hours later with the second load gear and we set up the camp, a small kitchen tent and a sleeping tent. We spent 5 days here, studying the spectacular intrusions of anhydrite (a salt mineral) into the sandstones and found some interesting results, heavy anhydrite is squeezed up before the main fold belt started, a proof that salt domes don’t have to be light to be mobile. I did publish an interesting paper on this. At night we would be on the radio with the base in Resolute and discover that the biologist had chat time at 8 PM on the second channel that was never used. Jeff joined in, attracted by the female voices of the biologists. There were some 3 or 4 fly camps with biologists in the area with only one man. After 7 weeks camping by ourselves, the female voices sounded like the sirens of heard by the Greek …….. while he traveled the Mediterranean Sea. Jeff being quiet a comic, would interrupt the conversations while changing his voice to a phantom, “wooooooooh, this is the phantom of the Arctic,……………..”, and say all kind of weird things. Being on the radio, no one could find out who this was, somebody listening in up to a distance of 800 km, the reach of the radio, or one of us? After five days we called the helicopter for a pick up. The first day the cloud cover on the Princess Margaret Range was to thick, he tried it but had to give up. Fine, next day we thought. At night we had another phantom session and reported to the biologist we couldn’t move which gave us some (female) attention. The second day was identical, flying was not possible. Now we got worried, and on two-daily region wide contact with the base “Expedition Fiord Camp” soon became know as the camp that couldn’t move which drew some nice attention from the female voices. The phantom session at night did help as well although I spoiled it by telling Jeff that the nicer the voice, the bigger the girls would be. Jeff didn’t want to believe me and preferred to believe they must be really good looking. The food went down rapidly, luckily we tend to take 5 days extra food and fuel. We still had sufficient bread and freeze dried food for another two days. The third day was the same, again no move and the base gave us the fall-back option to send a Twin Otter but this would cost us 6 precious hours we didn’t have, a $6000 additional costs. On the fourth day morning, after breakfast, we discovered that we used most of the food. We were down to half a loaf of bread and some sugar, even the freeze dried food was nearly gone. One more day staying here and we would be out of food and had to call in the Twin Otter. In 1984, five years earlier, this is how I got pulled out using the natural landing strip near the camp . I was joking to Jeff that as we had sufficient fuel and ammunition, we could either shoot a goose with young chicks nesting nearby. There were also two caribous in the valley, a mother caribou with a calf and the calf would be the best choice but shooting such a big animal and having to clean it did not appeal to us. Around 11 AM the helicopter pilot announced that the cloud cover was lifting a bit and he would try it. I separated the equipment in two loads, personal equipment and essential rock samples first, camping equipment and other rock samples second. At noon he arrived and we were relieved. I ran up to the helicopter which kept its engine running, put on a head set to be able to talk as the engine was very noisy and asked him about the plan. He said: “Only one load, dump the rest at the McGill University shack”. This was a simple wooden shack on the North side of the valley across the glacial streams which were to deep for us to cross on foot. It was built in the sixties for a major expedition studying the Thompson Glacier and was the only building on Axel Heiberg Island, an island the size of Switzerland or Holland. “If you find this please return this to Polar Continental Shelf Project. Owner is Ashton Embry, Geological Survey of Canada, Calgary. Jean van Berkel, University of Toronto”. I knew the shack would be visited only once every few years at the most and it may still be there now 13 years later. We went back and loaded the personal gear and the few rock samples. As the helicopter still had floats, the net pay load was some 100 kg less. We slowly tried to take off and it worked, we were not too heavy. If the load was still too high we would now have to kick out all the precious rock samples on the spot as we had insufficient fuel to return to the shack to drop off more stuff. We slowly moved up the Thompson glacier [1, right side of picture] and moved up slowly staying low just below the clouds and avoiding the strong winds higher up and looked at the impressive solitary rock peaks called Nunataks. The helicopter was still hit by strong side winds and in addition the clouds made the air unstable so we were rocking like a boat. After a long tense 20 minutes on the glaciers, we finally crossed the glaciers and saw the snow free plains of Eastern Axel Heiberg Island that would take us to Eureka in another 20 minutes. We dropped the equipment at the airstrip and walked up to a Twin Otter plane that was fueling up. Their passengers were three big girls that seem to have spent two months in a fly camp. They were well suited for the cold weather by their insulation, we thought. We recognized their voices, they were one of the camps of biologists with the Siren voices.